Right-click on the Windows Start button and choose Control Panel. Select Programs from within the Control Panel, then, under Programs and Features, select Turn Windows features on or off. 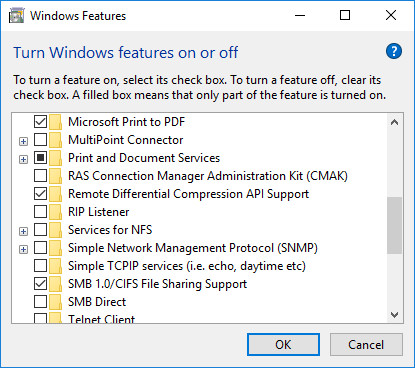 Find Simple Network Management Protocol (SNMP) in the list of features and click in the check box next to it, which will put a solid black square in the box, then click on OK.
Once you've added the SNMP service, the process for configuring it is the same as the process used for prior versions, such as Windows 7 - see Configuring SNMP on a Windows 7 System.